1 of 1 In a medium-size bowl, stir pineapple and juice, red pepper, red onion, cilantro, jalapeno, lime juice, salt and cumin. Cover and refrigerate until ready to serve. 1 of 3 Place flour on a large plate. Lightly beat eggs, cayenne and nutmeg in a shallow bowl. Spread cracker meal on another plate. 2 of 3 Dip chicken in flour, then egg mixture, then cracker meal to coat. Sprinkle with salt and pepper. 3 of 3 Heat 2 tablespoons of the oil in a large nonstick skillet over medium-high heat. Add half of the chicken and cook for about 5 minutes, turning halfway through cooking time, or until internal temperature reads 160 degrees F on an instant-read thermometer. Remove chicken and keep warm. Repeat with remaining oil and chicken. 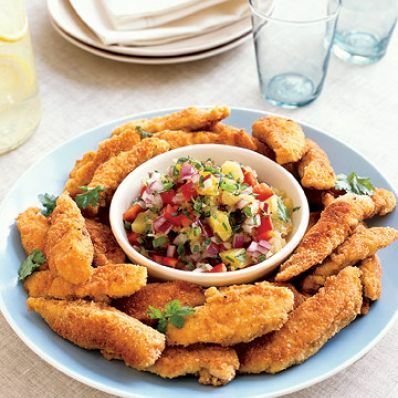 Serve chicken with salsa. 1 of 1 French fries.